David received his B.S. and M.S. from the University of Notre Dame and his Ph.D. in Biology and Biomedical Sciences from Harvard Medical School in 2004. He next completed his fellowship training at Children’s Hospital Boston in 2008. Along with Dr. A. Thomas Look, he is credited with developing the first transgenic zebrafish model of cancer. In his own group, he has made seminal discoveries underlying the pathogenesis of pediatric acute lymphoblastic leukemia and rhabdomyosarcoma. He enjoys swimming, fishing, golfing, and bicycling with his two boys and wife. *bio under construction; check back soon! Madeline is a post-doc from Toronto, Ontario, Canada and obtained her Ph.D. in Molecular Genetics from the University of Toronto in 2014. Her Ph.D. thesis explored the role for developmental Wnt signaling pathways and as a post-doc, she is interested in how these same pathways affect relapse of pediatric rhabdomyosarcoma. In her spare time, Madeline hangs out with her dog. He's the best. Alexandra is a post-doctoral fellow from Portugal, with a Masters in Biochemistry and Cellular and Molecular Biology with Distinction and a PhD from the University of Liege in Belgium, studying the functions of three members of the SoHo involved in zebrafish angiogenesis. In the Langenau Lab, Alexandra works to generate novel B cell acute lymphoblastic leukemia (B-ALL) models in zebrafish and characterize their clonal evolution and cell of origin. Outside of lab, Alexandra enjoys the Marvel Cinematic Universe, running, and is hopelessly addicted to coffee. Claudia is a research fellow especially interested in rhabdomyosarcoma, utilizing the patient-derived xenograft mouse model along with the developmental STAR zebrafish. She got her Bachelor's degree in Wuhan University back in China, and then moved to another warm city, Atlanta, to pursue a PhD in Cancer Biology at Emory University. For her dissertation, she worked with her mentor Anna Marie Kenney to investigate the aberrant cell signaling in pediatric brain tumors medulloblastoma. She likes to play badminton, bike, or jog during her free time. She is also a big fan of board games; no gambling though! Alessandra graduated from Colby College in 2011 with a BA in Psychology and Biology, and a minor in Italian studies and Film studies. After college, she attended THE Ohio State University for Graduate School, where she graduated with a PhD in Neuroscience in 2016. Her thesis work generated and characterized a novel model of the aggressive brain cancer Glioblastoma in zebrafish. While in Columbus, she attended lots of football games and sporting events. Go Buckeyes! In the Langenau Lab, she is interested in studying developmental pathways that are switched back on in rhabdomyosarcoma. In her free time, Alessandra loves to travel with her family to their houses in Martha’s Vineyard and Umbria, Italy. She also likes to visit friends, plan parties, watch sports, attend concerts and shows, cook and try new restaurants. Yan was born in China but moved to Singapore with his parents at the age of 7. He graduated with a PhD from the National University of Singapore in 2016, focusing on using zebrafish to model human liver cancer. 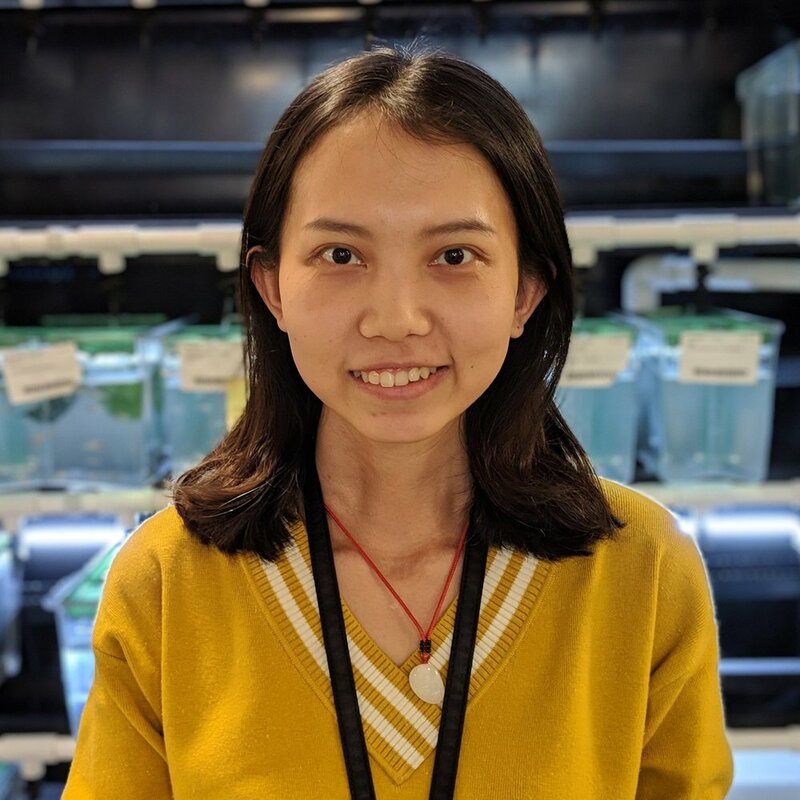 In the Langenau lab, Yan works on developing immune compromised zebrafish models that are capable of engrafting various human and mice cells, and establishing various protocols that help in the engraftment of these foreign tissues. Outside of lab, Yan spends most of his time online shopping as a coping mechanism for lab-induced stress. Sowmya was born in India, but has been in the US for almost 20 years now. She have a PhD in Bioinformatics from Boston University. As Computational Biologist here at MGH, Sowmya help multiple labs in Molecular Pathology make sense of the rich and varied -omics data they generate. Elaine graduated with honors from UC Davis with a B.S. in Neurobiology, Physiology, and Behavior and is currently pursuing her doctorate degree at Harvard Medical School, with a focus on cancer therapeutics. She studies the cellular and molecular roles of enzymes in aggressive and treatment-resistant T-cell Acute Lymphoblastic Leukemia. During Elaine’s spare time, she leads and coaches Harvard's Dragon Boat Team, enjoys organizing wine and hors d’oeuvres events, bakes intricate pastries, and avidly reads science-fiction novels. Saara is a visiting Ph.D student from University of Tampere (Finland). She graduated with MSc degree from the biotechnology study program of University of Tampere in 2014 and started her Ph.D studies in the lab of adjunct professor Olli Lohi in 2015. The two main focuses of her Ph.D projects are to better understand the expression level perturbations in T-cell Acute Lymphoblastic Leukemia (T-ALL) and to look for the repurposing of existing drugs for T-ALL treatment. In her spare time she enthusiastically practices archery and horse back riding - occasionally at the same time. Dalton is an undergraduate at Harvard University who is studying Human Developmental and Regenerative Biology with a minor in Global Health and Health Policy. He works under the supervision of post-doctoral fellow, Chuan Yan to help create models that are capable of engrafting various human and mice cells. In his work, Dalton focuses on creating new transgenic fish models and enjoys any chance he gets to work with mice. After his graduation, he has plans to attend medical school. In spare time, Dalton is a nationally recognized softball umpire and avid outdoor sportsman. Dan is a native of Lynn, MA, and he graduated from Bowdoin College in 2018 with a B.A. in Chemistry, with honors, and a minor in Visual Arts. In the Langenau Lab, he assists Chuan with his research projects and the maintenance and care of the zebrafish. Outside of lab, Dan likes to move heavy objects up and down repetitively (ie. lifting weights), shoot projectiles through metal loops (ie. playing basketball), and be a hero in his nightlife (ie. crushing video games).